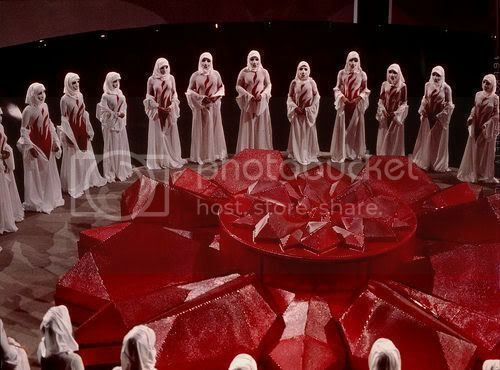 This week I've been obsessing over Logan's Run since I started watching it with my friends: I'm way into semi cheesy dystopian sci fi movies and this is definitely one of my favorites. Besides having incredible costumes and a sick soundtrack, I liked it because it hits kind of close to home. Literally: it was primarily filmed in the Dallas Fort Worth metroplex. It's pretty eery to see these places I've been to before, filmed as if they were in the future-but actually filmed in 1975. The scenes in this building were filmed in the recently demolished Dallas Apparel Market. I'd been there with my mom a year or two before it was torn down. I hadn't seen the movie then but it had struck me as a really cool building, it's a shame that it isn't there anymore. 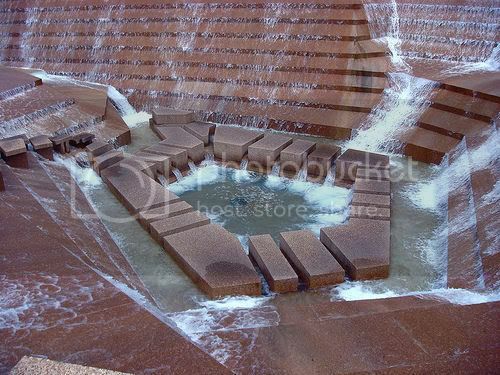 The Fort Worth Water Gardens (below) were also used for the movie. I was really impressed by the costumes too, slinky sheaths in christmas red and mint green, worn with sheer matching tights and capes: this goes for both sexes. Not to mention the costumes in the renewal ritual: very eery. I was wondering what happened to them all: they must have made a trillion of them for the movie. I wonder if you could ever come across some of them on eBay. 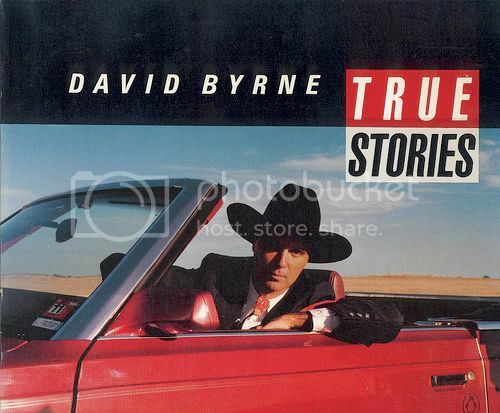 This post is about to get sort of random-but after seeing Logan's Run and driving through bleak Texas landscapes this weekend, I was reminded of another great movie that was filmed (and set) in Texas: the 1986 musical True Stories, directed by and starring David Byrne. It is the only 'musical' I have ever found enjoyable-I'm a big fan of David Bryne and the Talking Heads-the soundtrack is excellent. This movie is a celebration of wierdness and the kinds of eccentric personalities that flourish in the cultural wastelands of Texas. Embrace the wierd and remember, "shopping is a feeling". Here is a clip of my favorite scene: the insane fashion show with the brick and grass suits. This was filmed at the North Park mall here in Dallas. I have a ton of pictures from my trip, I'll try to get them up as soon as possible! true stories is one of my favorite movies and the runway show is the best best part. Hey Kiki! haha it’s surprising to hear that someone who lives so close to me reads my blog! I don’t actually live in Southlake: I live in Trophy Club. Yep, the heat is getting really old-however I find that I spend very little time outside and that the places I frequent are blasting the AC so much that I get pretty cold inside. If I’m not in Dallas I’m usually getting mexican food or books and magazines at Town Square ;P you’re right, there really isnt anywhere to go dressed up here, so i just wear whatever i want wherever I want to! what else is a girl who loves clothes gonna do? 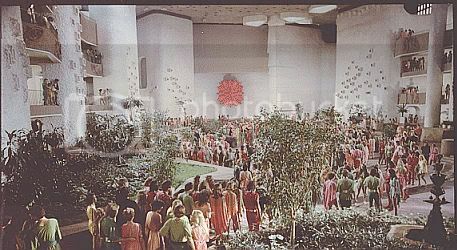 I recently discovered ‘Logan’s Run’ too and thought it was fabulous. If you’re interested in more aesthetically beautiful futuristic dystopian classics, try ‘Forbidden Planet’ and ‘Metropolis’. ‘Metropolis’ is silent, B&W and has seen a resurgence of interest lately, so you shouldn’t have any problems. ‘Forbidden Planet’ might be a bit harder. I adore David Byrne too. Talking Heads’ Stop Making Sense is only, what, the greatest album ever! hehe i love both those movies, especially Forbidden Planet: my mom was thisclose to naming me Alta after the leading lady! I love your Blog, Jane. It is one of the first things I look for on my computer every morning. It keeps me tuned in on what is going on in your age group. I love that. It is important. Did you know, that you are in an online magazine? http://www.dirrtyglam.com/ – and then the one with Mischa Barton on the cover. Can’t remember what page though, but it’s definitely you. Wow! You are discovering all my favorite sci-fi from my teen years. 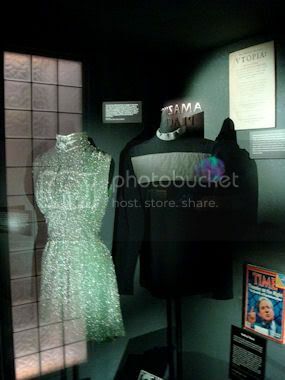 Funny seeing the photo of the Dallas Apparel Mart as my Prom was held there back in 1984 (Plano Senior High). Love the outfits! You have more style than any 16 year old I have ever seen. Hey! I just came across your blog after reading your profile on Refinery 29. You have amazing style and understanding of fashion for such a young age! Anyway, I used to work at the apparel mart (they moved us next door to the WTC) and, yes, it was a beautiful and unusual great hall….they had to tear it down since no one would touch it bc it was filled with asbestos! My daughter, Zoe, and I love True Stories. And DB’s book, New Sins. I also love the movie Logan’s Run. It was inspired by George Orewell’s book 1984. I just love your blog by the way. Wish you’ve got a wonderful day .Thanks a good deal for savoring this attractiveness page with me. Please retain sharing this kind of style of blogs from the long term also. hypertrophy competitive organization competition cause high body suppl training magazine world build workout lori level contest bodybuilder year sports sport.